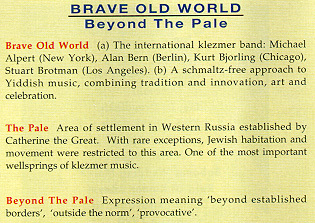 A glance at the explanatory panel excerpted from Brave Old World's award-winning CD (see right) will explain why this particular Procol website should have chosen to write about the work of a 'schmaltz free Yiddish super-group' (an excitingly modern and eclectic bunch of klezmernauts, as will become apparent). It also testifies to the excellence of the title 'Beyond the Pale', first used musically (to our knowledge) by Keith Reid on Exotic Birds and Fruit, then adopted by this fan website, and then by Claes Johansen's publishers for his Procol Biography. In each case there's a pun involved, of course: from the Procol perspective it is 'beyond A Whiter Shade of Pale' as well as being 'beyond established borders'; but from the klezmer perspective it's beyond Catherine the Great's 'Pale' (from Latin palum, a stake or fence-post), that ghetto which helped ferment a great national music of lamentation. But what does the phrase 'Beyond the Pale' mean ordinarily, to someone not versed in Jewish culture, or in Procol Harum? What did it mean to Brooker and Reid? Peter Christian recently drew my attention to the fact that 'Beyond the Pale' probably makes the UK person-in-the-street think first of the Irish Pale, that district of Ireland where English rule was effective following the 1172 invasion. But in any event 'Beyond the Pale' remains particularly ambiguous: it might well mean 'outside our oppressed community' in an Irish mouth, and 'outside our control' in an English one. This 'past the edge' suggests that Keith Reid's song treats 'pale' quite literally, as meaning 'boundary' (it's not his first song to deal with fence-penetration!). But obviously what's 'beyond' this ghetto-boundary will depend which side we're standing on to start with, whether we are insiders or outsiders. Evaluating this in the Procol context requires us to look quite carefully at the verbal and musical content of the song. Of course the words 'beyond the pale' don't occur in the song itself (they do in the sheet music, I believe, but not on record): 'beyond the veil', however, is a reference to the unknown state of the afterlife (it's also the title of an Oratorio supposedly dictated to the musical spiritual medium, Rosemary Brown, by the late GF Handel). The phrase 'beyond the veil' owes its spiritual implication to the layout of the Temple in Jerusalem, where a veil separated the Holy Place from the Holy of Holies, into which only the High Priest could pass, and that only on the Day of Atonement. This is the veil that was torn asunder at the time of Christ's crucifixion, (or 'crucifiction' as Reid, a Doubting Thomas perhaps, spells it): see Matthew 27:51 (at the same time graves opened, saints and prophets walked again, some entering the Heavenly city ... all imagery very familiar to devotees of Procol's Home album). In this Jewish light we are all, save the High Priest, outsiders. Clearly Reid's 'Holy Grail' resonates with this crucifixion imagery, since the Grail was the chalice used by Jesus at the Last Supper, which became (in an osmotic amalgam of Bible lore and pagan questing literature) the symbol of alluring unattainability for the Knights of the Round Table. In this instance, however, I feel that the Arthurian facets of Reid's physical search for the Grail are outshone by the reflection of Christ's passion in 'Who will share this bitter cup', which closely recalls His torment at Gethsemane (Matthew 26:39 et seq). But Keith Reid's final verse seems to cast aside questions of redemption: the Holy Grail is re-evaluated as mere 'treasure trove' (the same re-evaluation is condensed with delightful brilliance in New Lamps for Old: 'The eye of the needle, the loss of the thread' ... Matthew 19:24 and Mark 10:25 (and some Rabbinical texts) inform us that a rich man is as unlikely to get into heaven as a camel is to pass through the eye of a needle, yet Reid implies the loss of spiritual direction in the temporal banality of the subsequent sewing metaphor). Now Keith seems to be wildly seeking for companions so unperturbed by the 'wild dogs' and other hazards that they are able to contemplate a sweeping, piratical foray through the physical world, to 'scour the seas and scale the globe'. Yet when the chorus comes round again, its passion heightened by a key change (of which more below) it is harder to tell whether we are listening to an exhortation or to a warning: 'who will share this bitter cup?' ... 'who would be crazy enough?' Perhaps there is something here of the plight of the 'K' narrators in Kafka's great novels, all striving to enter another world though they know there is no guarantee whatever that their sufferings will be alleviated there. Kafka, a Czech Jew writing in German, created these 'outsider' narratives from an inescapable awareness of the ghetto; the novels centre on attempts not to escape confinement, beyond the pale, so much as to enter ... in the hope of participating (in the process of law (Josef K in The Trial), in the castle ('K' in The Castle) or in the new world (Karl in Amerika)). It doesn't seem inappropriate to mention Reid in the same breath as Kafka [note that Claes Johansen does this too in his Procol biography]: his text here shares that theme of the doomed quest, expressed with a peculiarly despondent yearning (Exotic Birds in many songs revisits the alienated worlds of the Shine on Brightly and Home albums, after some communing 'insider' experiences, characterised by the repeated 'we' in Grand Hotel for instance). But whether the metaphorical Pale here is like the Russian one, or its Irish counterpart, the song doesn't allow us to decide whether 'beyond' it lies a world of 'us' or a world of 'them'? Reid's song is characteristically allusive, rich, and perhaps ultimately immune to reductive scrutiny: Inside, outside? The hearer must 'find your own'. It might be more fruitful to ask whether Brooker's treatment of these words offers any definite geographical or demographic pointers, either in the musical arrangement or in the vocal performance. Tape-collectors will recall how he croons 'Mammy Blue' over the song's introduction on the Five and Dime bootleg, and the 'Oy ve, Shalom brothers, Shalom!' with which he concludes it on the 1974 KZEW broadcast from Dallas. Is the song intended to sound Jewish, or merely 'ethnic' in some vague sense (at Dallas one of his bandmates shouts 'Olé'!). 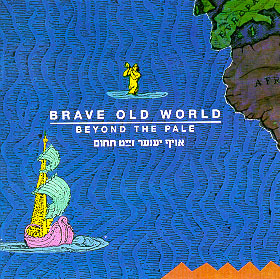 For rock fans, whose acquaintance with Jewish musical traditions perhaps goes no further than Fiddler on the Roof or the occasional burst of Hava Nagila, Brave Old World's 1993 CD would make an immensely attractive introduction to the wailing sonorities and mournful cadences that characterise klezmer music. The band's name may be backward-looking, but this is no retro collection, motivated by some sort of sentimental folkloric impulse: it's a real and vital fusion album by some gifted and scholarly musicians from North America and Europe, capitalising on the resurgence of interest in Yiddish music among Jewish communities worldwide (and of course including many international notables of the 'classical' scene, including Itzhak Perlman for example) and on the growing market for 'world' music in the Northern Hemisphere. The musicians on this album appear to balance a kind of bashless virtuosity with courageously simple playing, and the effect is hugely engaging. You will be mesmerised as well as klezmerised: you might end up dancing, or weeping, and you could also mistake bits of it for a mildly avant-garde jazz album: the whole thing is discharged with great joie-de-vivre, and pathos where appropriate. We listen to a huge variety of instruments (accordion, piano, drums, guitar, clarinets of various kinds, bass, cymbalom, Duduk, saz, penny-whistle, trombone) yet there are only four players, one of whom is also a splendidly moving singer on some wailing sorties. The arrangements are very varied from track to track, but reliable constants include the instinctive and elastic time-keeping, the sense of drama and urgency, and the constant melodic interest. Now it would be pretty facile to suggest that these are characteristics meaningfully shared by Procol Harum, though there are of course local, accidental correspondences. It would be slightly less silly, I suppose, to contend that the mood of Harum music reflects the band's quasi-Jewish lifetime of oppression following, and notwithstanding, the early revelation that, as Procolers, they were self-evidently a chosen people, apparently endorsed from On High, yet doomed to spend an epoch in exile. But I suspect that some of their most significant musical and lyrical traits were fixed before they'd been vouchsafed any hint of success, and Homburg (overtly dealing with self-consciousness about Jewish garb, and introduced by Gary Brooker in 1992 (see here) as 'a protest against anti-Semitism') can't be read as a reaction to commercial success and its falling-off – although many of the doomier songs on Exotic Birds – such as Butterfly Boys or New Lamps – undoubtedly can. None of these regions' native music really calls for the rasping banjo that Chris Copping played when this number was aired live, though maybe the time needed to tune that difficult instrument explains Brooker's various protracted introductions. In the aforementioned Dallas performance Gary finds time to explain (in bewilderingly erudite detail!) the origin of the phrase 'Pop goes the weasel' while Chris tunes up, and finally announces that he hopes to play this 'Neo-Slavic' number 'before men land on Venus! …). The song did live on in the band's repertoire when Chris moved over to play bass: but at Liverpool in February 1977, for instance (when it was briefly introduced as 'about the search for the Holy Grail', and played with exceptionally whimsical rhythmic freedom) Pete Solley's right-hand synths counterfeit not the banjo down-beats, but the interpolating high off-beat jangle that we hear on the record. Gary recalled that the studio twangling sound was originally BJ Wilson on mandolin; Mick Grabham has mentioned bouzoukis in that context; but whatever its origin, that exotic, 'ethnic' effect is further emphasised by the unusual harmonisation of the first four phrases of the vocal melody. The opening chords, i, v and iv, might seem rock'n'roll standard, but despite the minor tonality the v chord is also minor, not major as the dominant usually is. This, I think, gives the song its 'Eastern European feel', though Alan Cartwright's oompah bass moves the ambience westward a bit into the territory of a Bavarian drinking-song. Maybe there's something faintly exotic, to the English ear, in the melody's alternation of wide leaps and semitone steps, but we hear this in lots of Brooker songs (For Liquorice John for example) that don't sound remotely Jewish. The lurching pause that precedes the next section seems to recall the characteristic hiatus that marks the theatre songs of Kurt Weill, Jewish of course (and briefly taught music by the real Englebert Humperdinck ... and whose trademark spectacles appear for some reason to have been painted on to Keith Reid's face on the Grand Hotel inner picture (see illustration: KR, left; KW, right)). In concert Brooker occasionally used these lurching pauses to indulge his fondness for comic accents: On the Five and Dime bootleg he can twice be heard singing a Dietrich-like 'Who vill share', and once 'ziss bitter cup' which also enhances the Germanic feel. From here on, however, Procol's Beyond the Pale throws the Euro-pop / R'n'B rule-book away to most exciting effect. A path of surprises has already been laid by Barrie Wilson's odd little 7/8 drum-break: now the middle-eight (itself a surprise in a Procol song) announces itself by a bafflingly unpredictable modulation from C minor into A minor via B and E passing-chords on consecutive beats. This middle-eight seems to have rediscovered the sweet, perhaps naive, Brooker style that we hear at work in Shine on Brightly, A Christmas Camel, Holding On and almost in A Rum Tale, songs where the melody leads the chords, rather than being fitted in over a logically-constructed chordal scaffold ... except where he has to wrench himself back on-course to join up with the home key again. This is very ably done in the present song: his A minor sub-dominant of D minor leads naturally into a B flat bar and bingo! ... he's pulled out that music-hall G+ chord before the drum break brings us back into C minor. Yet there's an astonishingly bold key-change up a semitone into C# minor for the final chorus … maybe this was done just to make things as difficult as possible for the hapless banjo player! 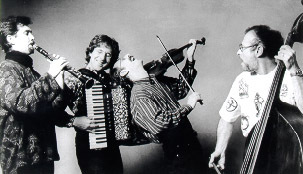 … and it could perhaps be argued that this also contributes a klezmeroid freshness: one of the significant flavours of the Brave Old World album relies on the C# present in the so-called Gypsy scale of C (though that scale has an E as its third degree, where this Procol Harum song favours E flat). So, as to the Jewishness of Procol Harum's Beyond the Pale, no conclusion, of course. As to the excellence of Brave Old World's Beyond the Pale, no question. It's sixty-nine minutes of exciting playing from renowned klezmorim, adding something significantly contemporary to a music that is often misrepresented as excessively sentimental, romantic and retrospective. 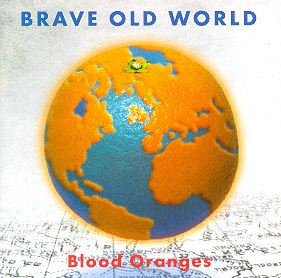 Their 1997 follow-up album, Blood Oranges, also on Pinorrekk Records, also won the Prize of the German Record Critics. Internet klezmer guru Ari Davidow called this 'truly new Jewish music'; and confessed that 'one could not even separate out any of the influences'. True, no doubt, as for the richly-interesting Procol Harum track discussed above. But let me finish by quoting an e-mail BtP received from Davidow: 'Yes, there is a highly regarded klezmer band which recorded an album called Beyond the Pale. It has nothing, conceptually or otherwise to do with Procul [sic] Harum or A Whiter Shade Of Pale.' I suppose it was the word 'Pale' that made Ari invoke AWSoP, which had not been mentioned in my opening e-mail, and I suppose it is unsurprising if he doesn't know any other Procol music. I have paraded my slender knowledge of his chosen field: why should he fear to do the same? But don't be fooled by his Procol-free generalisation: get hold of a copy of BOW's richly-enjoyable Beyond the Pale ... now the accordion fill (at 1:04, for example) in track 11, Bobover Wedding March ... where have we heard that before?